The Football Association has told sportingintelligence that talks with interested parties to become the next chief sponsor of the England team – succeeding Nationwide – are “progressing well”. And despite a slew of lurid recent headlines surrounding the private lives of a number of England players, including strikers Wayne Rooney and Peter Crouch, the FA points to positive results for some of its other sponsors, even during a World Cup this summer when England lost 4-1 to Germany in the last 16. “There are a number of parties interested and discussions are progressing well,” a spokeswoman said, but declined to comment on speculation that three parties are active in talks and one firm offer has been tabled. A variety of technology and banking firms have been linked to the FA’s headline sponsorship deal this year including Orange, O2, BlackBerry, Santander, Bing (Microsoft’s rival to Google) and even Facebook, although the latter put distance between itself and the speculation in the summer. It is also understood that another England sponsor, Mars, saw a significant boost in sales of millions of chocolate bars, on a year-on-year basis, during the four weeks of the World Cup. The FA has never confirmed the value of the arrangement with Nationwide, with whom the last contract in an 11-year-association was for a four-year period from 2006 to 2010. The global sport marketing and sponsorship research firm, SPORT + MARKT, put the value of that last deal at €10m per year (or £8.6m per year at today’s exchange rates). Reports earlier this year said the FA rejected a new four-deal worth £20m with Nationwide (£5m per year) before Nationwide severed ties. A spokeswoman for the FA said the €10m per year figure for the old deal and the £20m value of the new deal were both incorrect but declined to specify by how much, or whether those amounts were too low or high. An extensive piece of SPORT + MARKT research to coincide with the World Cup in the summer demonstrated how the England team remains among the most attractive in world football to sponsors. 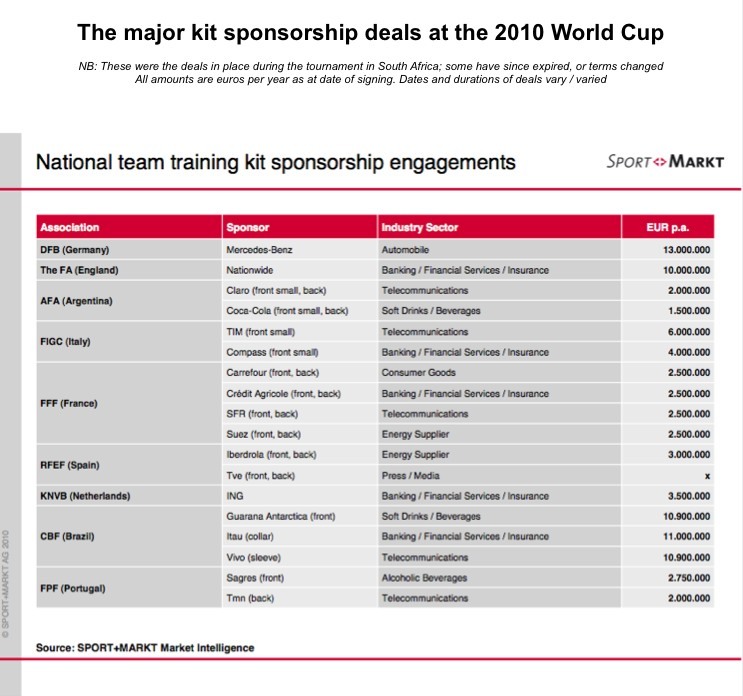 That research looked at the annual value to various national federations of their main sponsor(s), specifically those sponsors represented on national teams’ training kits. The findings of that research – valid at the time of the World Cup but subject to changes since – are published below with the kind permission of S+M. The Brazilian FA had three main sponsors in the category in question, collectively worth €32.8m per year, with soft drink firm Guarana Antarctica, bankers Itau and telecom firm Vivo. The German FA’s deal with Mercedes-Benz was worth €13m per year, while the national associations from England, France and Germany each had “kit” deals valued by S+M at €10m per year, respectively with Nationwide (England), four firms putting in €2.5m per year each (France, see panel for details), and two firms on €6m and €4m per year each (Italy, see panel for details). The FA’s chief sponsorship package is likely to include branding on all training kit and tickets, backdrops during press conferences and signs at home games and training sessions. A deal is expected to be finalised by December if not before.